This trailer comes directly from the Tokyo Game Show, so it may or may not be in a language that you don’t understand. Luckily, its inherent awesomeness can be understood by all. Hold on to your pants. From watching the trailer, one can gather that the paths of the Professor and Phoenix cross – duh – in some strange medieval realm and that there will be puzzles and trials! Get your luminol ready. In fact, if Wikipedia is to be trusted, the two (and their cohorts) find themselves in Labyrinth City where strange things are afoot. The bad guy this time is the Story Teller. OoooooOOOOOOooooo! Get ready because Professor Layton vs. 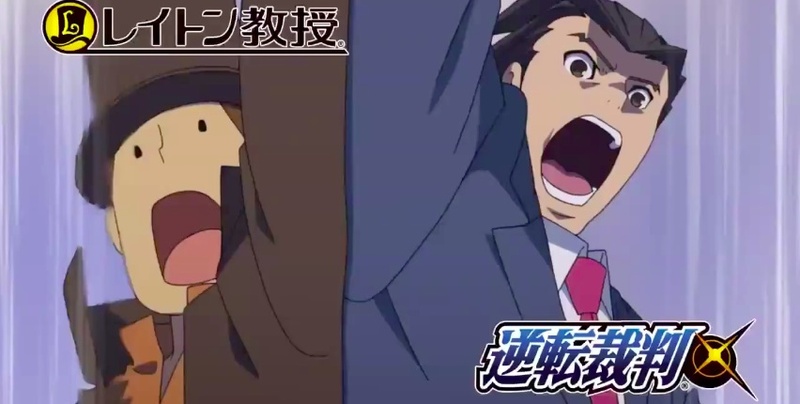 Ace Attorney is coming out for the 3DS on November 29th…in Japan. What?! No North American release? OBJECTION! Although no hard evidence has been found, the game has been found on a few western retail lists and won a poll Level-5 put up about which game their fans would most want to see in the States. Hopefully at TGS they will announce it, but as of this writing we still do not know for sure. This looks freaking awesome. I haven’t played any of the Ace Attorney games, but I love Layton. If this happens, this might be when I upgrade to a 3DS! The Ace Attorney games are really fun, too. It will be a great combination.